Ali joined the Pelican Valley team in 2017. She grew up in Hazen, North Dakota and graduated from NDSU with a Bachelor’s degree in Accounting and a minor in Fraud Investigation. While in college, she met her husband, who is a Pelican Rapids native. She and her husband were excited to plant their roots in the Pelican Rapids community. Prior to joining Pelican Valley, Ali worked in public accounting. Aleina joined the Pelican Valley team in 2018. Cassie joined Pelican Valley’s team in 2013 as a Business Office Assistant then transitioned into her Human Resources Coordinator role in 2016. She grew up in the country between Rothsay and Pelican Rapids. Cassie has an Associate’s degree in Financial and Credit Services from M State in Moorhead and a Bachelor’s degree in Business Administration from MSUM in Moorhead. Before coming to Pelican Valley, Cassie worked as a clinic registrar, bank teller and dietary assistant. In her free time, Cassie enjoys spending time with family, being at the lake, hunting and cooking. She lives in Pelican Rapids with her husband and son. Karin joined the Pelican Valley team in 2017. She grew up in Moorhead, Minnesota and graduated from Minnesota State University Moorhead with a Bachelor’s degree in Mass Communications. 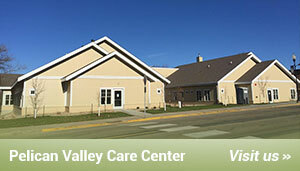 Prior to joining Pelican Valley, Karin worked at the Land of the Dancing Sky Area Agency on Aging for almost 18 years. In her free time she enjoys crafting, gardening, baking and cake decorating. Karin and her husband live outside of Pelican Rapids with their two children and three cats. Mark has been helping keep Pelican Valley up and running since 2010. He was born and raised in Pelican Rapids. Mark spent 30 years managing a turkey farm. He has two daughters and a wife, Karen, who also works at Pelican Valley. Kara was born & raised in the upper Red River Valley near Larimore, North Dakota. She graduated from NDSU in Fargo with a Bachelor’s degree in Food and Nutrition and a minor in Child Development and Family Science. She then completed her Dietetics Internship in Grand Rapids, MI. Kara has 10+ years of experience in Clinical Dietetics and Food Service Management. This includes working in clinical and management experience with long term care nursing facilities, menu and product development with a food service distributor and menu development, clinical and food service management with a food service management company throughout ND, MN and SD. On a personal note, Kara enjoys crafting, reading, baking and cooking. She especially enjoys family fun time with her husband, and four growing children. Kara joined the Pelican Valley team in 2014. Megan joined the Pelican Valley team in 2018. Anna has been with Pelican Valley since 2015. She went to The University of Mary in Bismarck where she obtained her Bachelor’s degree in Nursing. Anna worked in Fargo at a hospital for 10 years before moving back to Pelican Rapids. Anna lives in the country with her husband and 3 young boys. Renee joined Pelican Valley in 2014. She started school in Pelican Rapids and has lived here ever since. Renee likes to keep active and be involved with community events. Her careers have been in the restaurant business, 15 years of home daycare, and numerous years at Pelican Drug. With her husband Paul, they raised four children and are now enjoying six grandchildren. Renee enjoys music, traveling, and golfing. She also loves to host parties and events and can’t get enough hours of fun at Lake Lida! Curt worked as a dairy farmer for much of his life. He has a degree in heating and air conditioning from Minnesota State Community & Technical College in Moorhead, MN. Prior to joining Pelican Valley, Curt worked at West Central Turkeys. Curt has been with Pelican Valley since 2013. Angie has been bringing fun and laughter to our tenants since 2015. She went to Willmar Technical College for Retail Merchandising. She worked in retail for three years then spent some time working in home health. Angie worked at Nelson Gables in Alexandria as a Resident Assistant for ten years before moving to Pelican Rapids. Prior to joining Pelican Valley, Angie also worked as a paraprofessional at the Detroit Lakes High School. When she’s not at work, Angie enjoys shopping and doing anything with her family.